Early morning flights usually make me especially grumpy, but the sight of seven beautiful Land Rovers welcoming us at Nagpur airport was enough to perk me up to no end. 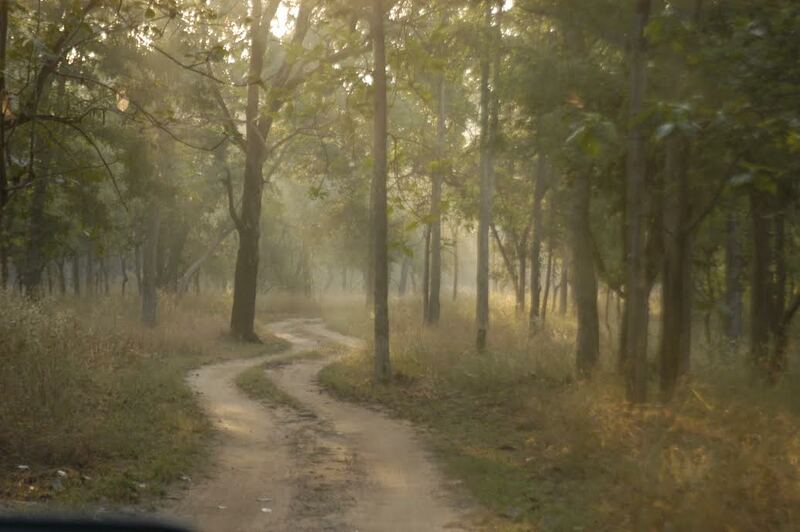 I could hardly wait to get on the road and speed off without further ado, towards the feline beasts of Pench National Park. Two Freelanders, three Evoques, a Discovery and a Range Rover Sport stood glistening in the crisp wintery morning light, emblazoned with large tiger pug marks and the Born Free Foundation logo. This was, after all, a journey to celebrate Land Rover, The Born Free Foundation and the release of a book on tigers by automotive journalist and wildlife lover Bob Rupani. The Born Free Foundation is an international wildlife charity working throughout the world to stop individual wild animal suffering, and protect threatened species in the wild. The foundation empowers local conservationists by restructuring existing projects into a network of partners operating across a landscape, funding their specific needs and developing better communication between them. Serendipitously, I was allotted bragging rights, with the keys to the Range Rover Sport. Priced at well over a crore of rupees, this 2993cc behemoth devoured the miles between Nagpur and Pench, effortlessly gliding over the beautiful highways. Luxurious and fast, it responded instantly to the slightest touch on the accelerator, while maintaining a stately elegance. Closer to Pench, when the highways degenerated into crater-filled tarmac, worsened by the monsoons and trucks, it sped over the potholes with ease. Even when I put pedal to the metal on these roads, the suspension made sure that I hardly felt the violent bumps. Things got worse (or should I say better) when we were led off-road by the Land Rover crew, who had discovered a hard trail through forests to take us to our hotel; all the cars responded superbly to the hostile conditions, with the convoy of seven almost There were many moments when the tracks seemed to be impossible to drive across, but the cars did so without the slightest groan or squeak of protest; the resultant layers of mud and dust on the cars only added to their rugged charm. Unscathed by the harsh terrain, we arrived at our hotel on the edge of Pench National Park – the charming Taj Baghvan Lodge, named after one of India’s iconic symbols, the Bengal tiger. We checked into charming bungalows with attached machans, alongside a picturesque nullah (dry riverbed), surrounded by the shaded canopies of forest trees. The hotel is a very friendly place, with a rustic and homely atmosphere, which made us all relax and feel like we were blending easily into the forest. First on the agenda was the launch of the book “Tracking The Tiger”, a beautifully mounted labour of love created by Land Rover and the inimitable Bob Rupani. The launch was appropriately conducted in the dry river bed of Baghvan, a favourite corridor for tigers. Naturally, many of us stole furtive glances around the river bed, almost hoping to see a tiger sauntering towards us in the sunlight. The old adage “careful what you wish for” came to mind as we sauntered off for a fine lunch, followed by an afternoon drive into the national park, which is home to several endangered species. The tiger is dominant here, and there are around 25 of them in these prey-rich forests; other predators include leopard, wolf, hyena, jackal and jungle cat. There’s also rich bird life, with over 300 species, including parakeets, hornbills, kingfisher, barbets, minivets, orioles, wagtails and a host of raptors: the crested serpent eagle, crested hawk eagle and white-eyed buzzard. We drove into the park three times over the weekend, but sadly failed to see any tigers. We did, however see a leopard with a kill (generally a rarer sight than a tiger), jackals, nilgais, bison (again quite rare) and wild boar. We also drove to a few quaint villages, where we saw the work being done by the Born Free Foundation in conjunction with Land Rover. To top it all off, there was a campfire dinner on the last evening, where a wonderful time was had by all under the starry skies. The next morning, the Range Rover Sport sped me back across country roads and highways to Nagpur. On the cramped seat of the flight back, I found myself yearning for the comfort and luxury of the Taj Baghvan Lodge and, of course, the Range Rover Sport.